Very old holiday development, surrounded by trees and fields. 25 apartments in the property. 3 km from the centre of Asciano, 30 km from the centre of Siena, 100 km from the centre of Firenze, in an elevated position on top of a hill. For shared use: park 18'000 m2, swimming pool (20 x 8 m, depth 70 - 160 cm, 01.06.-30.09.). Heating to be paid on the spot (01.11.-15.04. ), heating available only from 01.11. to 15.04.. Parking (for 2 cars) at the house. Supermarket 3 km, restaurant 3 km, bar 3 km, railway station "Asciano" 3 km, thermal baths "Rapolano Terme" 12 km. Nearby attractions: Abbazia di Monte Oliveto 7 km, Crete Senesi 1 km, Pienza 35 km, Siena 30 km, Firenze 106 km, Montalcino 30 km. Please note: car recommended. Suitable for families. The keys‘ handover takes place by the agency Il Casolare in Asciano, 3 km. 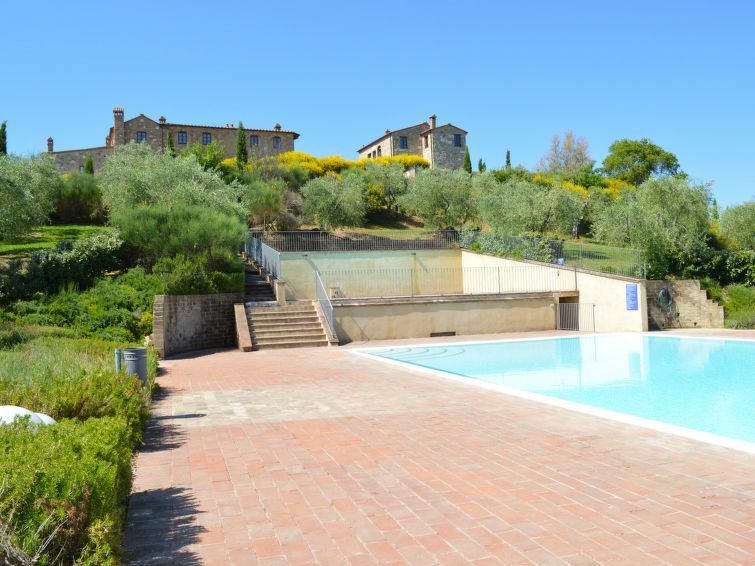 There is a second swimming pool (6x5 m, 140 cm deep, open from 01.06 to 30.09) available for shared use. "this property", 3-room apartment 80 m2 on 2 levels. Simple and comfortable furnishings: open living/dining room with open-hearth fireplace and TV (flat screen). Exit to the garden. Kitchenette (4 hot plates, mini-oven, freezer). Shower/bidet/WC. Upper floor: 1 double bedroom. 1 room with 1 bed and 1 x 2 bunk beds. Bath/bidet/WC. Garden. Terrace furniture, barbecue. Facilities: washing machine, baby cot for up to 2 year olds (extra). Internet (WiFi, extra).